When Ko Un sang the folksong Arirang this fall at the Frankfurt Book Fair, at which Korea was the featured guest nation, his rendition was so poignant that it made the Germans in the audience noticeably uncomfortable. Ko Un was a nominee for the 2005 Nobel Prize in literature, and although he did not win, he has succeeded in bringing Korean literature into the international spotlight with the release of three most recent volumes in English. There were no windows in my cell. It was so dark you couldn't even see the urine bucket in the corner of the cell when the lights were turned out. The darkness was like a dream, and in that darkness and isolation people from my past came to visit me-my parents, grandparents, friends, people I'd met in passing, people I had never met at all, historical figures… I spoke with these faces that came to me. I wanted to record every one of them as a poem. At the time I thought that I was going to die, but I swore if I should live I would write a poem for each of them. It was this mission that gave me the strength to carry on. The project is now past its 20th volume, and the recent translated version of Ten Thousand Lives presents a selection from the first ten. the table seller visits our village. a man with a straggly beard. Sentenced to life imprisonment for opposing South Korea's military dictatorships in the 1970s, the poet Ko Un decided to write a series of poems chronicling the lives of everyone he had ever come into contact with. This Green Integer paperback, with a wonderful introduction by Robert Hass, brings together a selection of these portraits, most of them about a page in length. But the most striking portrait is the first: a photograph of Ko Un himself, whose expression of implacable and jolly fortitude sets the tone for the collection. Alert, bracing, immediate, and folksy, Ten Thousand Lives is a gathering of peoplemostly village folkthat does not discriminate between riffraff and bigwigs. The exclamatory and often tinny voice of the speaker is never brutal, but consistently achieves a brightness of tone that exceeds clarity and teeters on the brink of the surreal. In "The Wife from Kaesari," the culturally situated restraint of a village woman is treated to such brightness: "Knowing no eloquence in her lifetime, / she was incapable of any decent last words. / She was more or less heard to say / the lid of the soy-sauce jar upon on the terrace / ought to be opened to the daylight / and also, it seems, / the lining in father's jacket ought to be replaced." There is no way of getting around the deeply moral impulse that governs these compositions, but a poem like this one doesn't allow judgment to be its focus. Conscience, especially in the earlier poems, acts more as a structural principle than one that makes the poetor the persons he memorializesreflective. Meeting a handsome murderer in jail, Ko Un writes, "That bright smile / those graceful movements / undoubtedly the star in some movie / only it was as if somewhere in his life / the seed of that dreadful act had sprouted / and grown up, taking his body for humus." Indeed each person in Ten Thousand Lives seems both excruciatingly present and terrifyingly absent. More than, or at least different from, a collection of poems in the traditional sense, Ten Thousand Lives is an uncanny testament to the brutalities of history and a nervy attempt to remind us that individuals are worth dignifying. Missing from the collection, unfortunately, is Ko Un's original introduction, in which he issued a declaration of independence from all foreign literary influence. No longer would he be seduced by graceful Chinese evocations of nature or the cryptic modernism of the West. In their place, Ko Un has constructed a rustic vernacular, a poetry of the Korean countryside as earthy as the mountain vegetables that deepen the flavor of Korean food. In these poems, a woman has "a laugh like cold bean-sprout soup," a man is so dull that he is "cousin of water,/or of watered-down soy-sauce." Each poem resembles a miniature folk tale, expressed with koan-like simplicity, cautious of metaphors or abstraction. Much of South Korean history is poured into this folkloric mold, from the partisan fighter who gave birth in her cell before being hanged at the scaffold in the early 1950s all the way to dissident Kim Dae Jung, "the embodiment of suffering/at a time when suffering was needed," who became president in the 1990s. that cold aunt who had wept her fill. Looking away from the war-torn images of bombings and horrific violence on my TV screen, out the window I see the vast blue sky, the primordial empty space beyond concept or thought. In the Buddhist tradition this is called ‘Buddha nature’, our natural state of mind which is luminous, open and compassionate. A magnificent reminder of this “sky mind” in the midst of the world’s chaos is the Korean poet Ko Un’s book, Maninbo (Ten Thousand Lives). It is a monumental work of twenty-five volumes containing short poetic portraits evoking, one by one, the many people Ko Un has encountered in his life, beginning with his childhood village and expanding out to figures in literature and history. Ko Un is widely acknowledged to be Korea’s foremost contemporary poet; yet he is not “the literary poet” using his art to put a grid of order unto chaos (which is ultimately too simplistic and dualistic a perspective), but rather he is able to see from a bird’s-eye view, all perspectives, without superimposing any judgment, pity or revulsion. He is able to be Chae-suk, ‘the girl from the house by the well, a brimming crock of water perched on her head, gazing into the far-off distance as she walks; he is able to be Uncle Man-sik, ‘someone like watered wine, so insipid he even bows down before kids’; he is able to be six-year old Pyong-ok, ‘rushing out to the rice-paddy foraging for snails half a day who drank lye by mistake and died.’ He is not just ‘able to be’ but rather ‘he is’ that person, for he has stepped beyond duality into the realm of feeling one with other. This is a direct result of his early life of extreme poverty and hardship during the oppressive Japanese Occupation and horrific Korean War, plus his later years of confinement & torture as a political prisoner, but most of all a result of his living as a Zen Buddhist monk for many years before settling into a married family life. He has expressed his passionate political & humanistic views through his prolific works of more than 100 books. 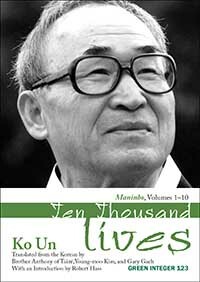 "Ko Un's Ten Thousand Lives"
This remarkable volume selects from the first ten volumes (there are now 23) of the South Korean former Buddhist monk's life time project to describe every person he has ever known through poetry. Imprisoned during the Korean War, beaten by police, tortured by having acid poured into his ears, and imprisoned four times during South Korean's democracy movement, Un is Korea's greatest living poet, assumed to one day win a Nobel Prize, and a leading figure in Korean politics and culture. Robert Haas in his superlative introduction to this volume which places Un in world literature describes how Un, while in prison facing a 20-year sentence that began in 1980, in pitch-dark solitary confinement, conceived of this project. Released in 1982 as a result of a general pardon, he has continued to compose the Lives, but also translations, a narrative poem, novels, criticism, and small Zen Buddhist poems. In 1999, I reviewed Un's book of Korean poems, Beyond Self, here. Pun-im with her eyelashes so long. and below it her busy feet soak it up too. Pun-im, who never loses a drop from her water buckets.